One of my first features was model scaling inspired by creative VR applications like TiltBrush and GravitySketch. It works by locking the controller position to the world. Pressing two grips simultaneously will allow you to move, scale and rotate the world (entire 3D model) The work-plane scale shown in the previous video allows for a more precise control of the architectural scales. The laser movement system was one of many inspirations I got from the prototype of Thomas van Bouwel it’s based on interaction with lasers to move, scale and rotate objects in 3D space. Lasers pointers proved to be a convenient method when working with distant objects. This is one of my favorite new tools for manipulating the size of 3D objects. 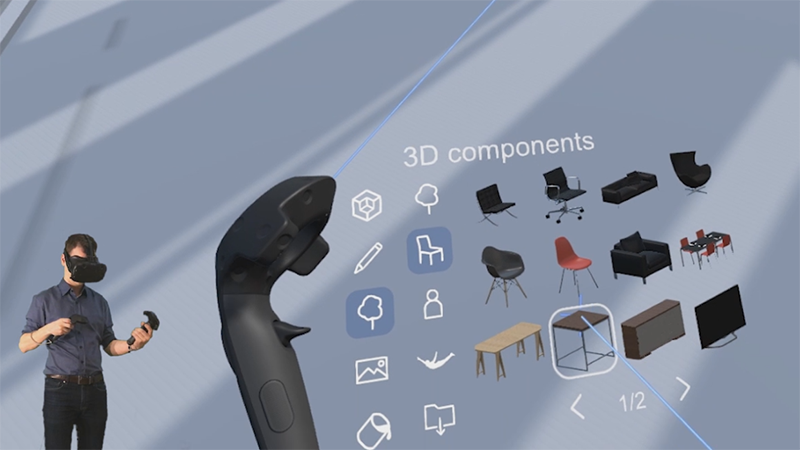 The grips allow your to stretch the object in one direction to give individual control over object manipulations and allows you to “sculpt” your shapes in the required size and proportions. I am planning to include more snapping methods and dimensions overides for these grips in the next versions. What is an architectural program without a library of pre-built components? I added some new components and a better system to show and organize them by categories. More architectural objects and options to customize and filter the library will be added later. A radial selection menu will open when an object is selected (inspired by Revit’s ribbon). This allows you to delete, duplicate, lock and re-position objects in the scene. I plan to add extra modification options like snapping, joining cutting and grouping in future versions of this modification tool. When an object in in placement mode (new, duplicate or reposition) this will convert the touchpad of the Vive to a swipe sensitive controller to quickly rotate and scale objects intuitively. If you press the touch-pad it will scale and rotate the object in fixed steps. (similar to Revit’s snapping) I’m thinking to add more snap controls to this placement mode later. I’m planning to release a Beta of ArchiSpace this summer, I’m still working on some key functionalities like loading and saving your files to a re-usable format. If you own a HTC Vive and like to receive updates on the release be sure to visit my website www.archispacevr.com (also under construction 😉 ) and subscribe to the mailing-list to receive the first updates on the latest developments and release of ArchiSpace. I am creating ArchiSpace in my spare time so it will need time to develop. In return I want to give my subscribers free early access to the program. If you like to help or support this project, you are welcome to contact me. Want to hear me talk or try ArchiSpace at your event? I enjoy to demonstrate and share my vision on our future architectural tools at conferences or hackathons so feel free to contact me if you like me to be part of your event. I can demonstrate how to use Virtual Reality, BIM and other Design Technologies for architects and teach how to start developing your own VR applications. Hope you like how ArchiSpace is developing . Let me know your thoughts on virtual prototyping for architecture and what features you would like to see most in this application. I might be able to add these in the future updates! Wederom dank voor jouw prachtige initiatief tot het ontwikkelen van ArchiSpace, ik volg met belangstelling de ontwikkelingen. Wij hadden eerder mailcontact over ontwikkelingen op VR gebied. Je adviseerde ons toen als beginende VR gebruiker te gaan voor een Oculus. Uiteindelijk heb ik een Alienware laptop aangeschaft met een GTX 1070 met een HTC Vive. Alles werkt prima, zowel op Revit als Sketchup platform e.e.a. tezamen met Enscape. We kopen nu ook voor de zaak een complete set, maar hierbij hebben we wél gekozen voor de Oculus setup, omdat dat toch i.s.m. derden handiger is op te zetten en uit te leggen, eigenlijk precies wat jij al zei! We houden contact, keep up the good work Johan.